Writing history as they set on foot to Islamabad from Quetta three months ago, the families and supporters of the people reportedly whisked away by intelligence agencies from various parts of the restive Balochistan province, reached Rawalpindi on Thursday, travelling more than 2,000 kilometres in adverse weather conditions and intimidation by government agencies. The participants, led by Mama Qadeer Baloch under the aegis of the Voice of Missing Baloch Persons (VMBP), hope to raise awareness about human rights violations in Balochistan and demand the recovery of their missing relatives. Mama Qadeer told Pakistan Today that the marchers were disappointed with the government and were frustrated with the courts. He said that they wish to present their demands to the United Nations in Islamabad. “We are even ready to ask the UN to send North Atlantic Treaty Organisation (NATO) troops to Balochistan to recover our loved ones,” he said. Mama Qadeer has been campaigning for the recovery of missing persons since 2009 when his son Jalil was killed in the custody of secret agencies. The marchers said that they have faced many problems in their journey. Around 30 people are participating in the march and plan to continue their journey via Murree Road to Islamabad, which is around 30 kilometres from the UN office. 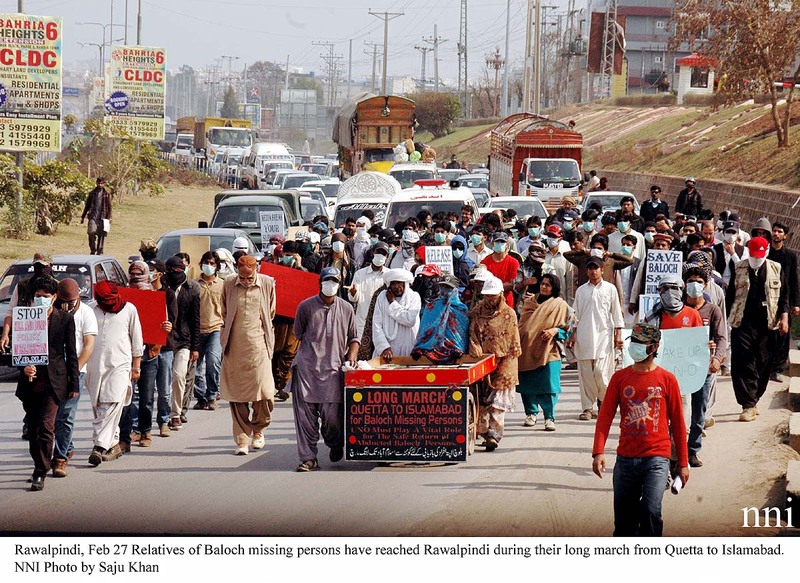 The march had started from Quetta on October 27, 2013. The first phase, a 730-kilometre walk, ended in Karachi with a demonstration in front of the press club on November 23. The second phase began in mid-December. The participants walked through various cities of Punjab, including Multan and Lahore, where they were threatened by unidentified people on the telephone to turn back and desist from heading to the federal capital. “We have been protesting for the last five years for the recovery of our loved ones,” Mama Qadeer lamented. Mama Qadeer, aged 72, and 11-year old Ali Haider Baloch are not aware that they have made history. They and the other participants broke the 84-year-old record of Mahatma Gandhi who travelled for 390 kilometers on foot from Ahmadabad to Dandi as part of his famous salt march. When Mahatma Gandhi started his march in 1930 to protest against the salt laws of the British government in colonial India, he was 61 years old. Chinese leader Mao Zedong also started a long march in 1934 but this long march was actually a military retreat undertaken by the red army of Communist Party. There was no single long march but a series of marches because various parts of the red army in the south China escaped to the north and the west. The red army of 41 years old Mao Zedong regrouped and then attacked Kuomintang. This long march was part of a military strategy. It was not a political long march. The word long march was used and abused by many politicians after Mahatma Gandhi and Mao Zedong but nobody traveled on foot. Most of the politicians used vehicles in their long marches. Late Benazir Bhutto even took a rail ride in her long march from Lahore to Islamabad against Nawaz Sharif government in 1992. She called off the long march near Wazirabad when she was informed that President Ghulam Ishaq Khan had decided to demand resignation from Prime Minister Nawaz Sharif. Nawaz Sharif also used the word long march in his Tehreek-e-Nijat against Benazir Bhutto government in 1994. The word long march was again used in lawyer’s movement for the restoration of deposed judges. Nawaz Sharif started his long march from Lahore to Islamabad in March 2009 but he was travelling in a jeep not on foot. Ali Haider Baloch stopped going to school and joined the long march with his elder sister Saba. His father Ramzan Baloch was abducted in front of the eyes of young Ali Haider. Farzana Majid Baloch is a well-educated woman. She did her Masters in bio-chemistry from Balochistan University and has been raising voice for the production of her younger brother Zakir Majid Baloch since 2009. She is secretary general of VBMP and the moving spirit behind this historical long march. Daughters of two missing doctors, Deen Muhammad Baloch and Akbar Marri, are also participating in this. The daughter of a missing lawyer Haider Khan Baloch advocate was disappointed in courts and joined the long march of Mama Qadeer Baloch along with some other women. Defence Minister Khawaja Muhammad Asif visited the marchers’ camp in Karachi in December 2013 and assured Mama Qadeer that their dear ones will be produced in courts soon. The defence minister has been unable to keep his word so far!